I'll always feel like the storyline of The Matrix sequels was poorly told, but I am convinced that these movies did in fact have a strong story hidden underneath. Themes of control, power, science, faith, purpose vs programming, man vs machine, choice vs causality all resonate strongly in sequels to "The Matrix" but are unfortunately lost among a sea of unnecessary sequences, silly movie twists, and psuedoscience. Fanedit.org - Everyone who kindly provided constructive criticism and reviews of my initial release! 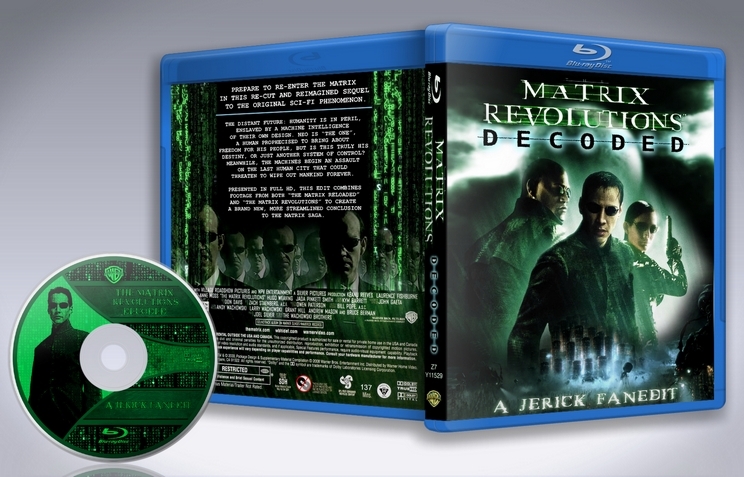 Opening of the movie following title sequence picks up immediately after "The Animatrix: The Last Transmission of the Osiris" ends using live action scenes from the "Enter the Matrix" video game. 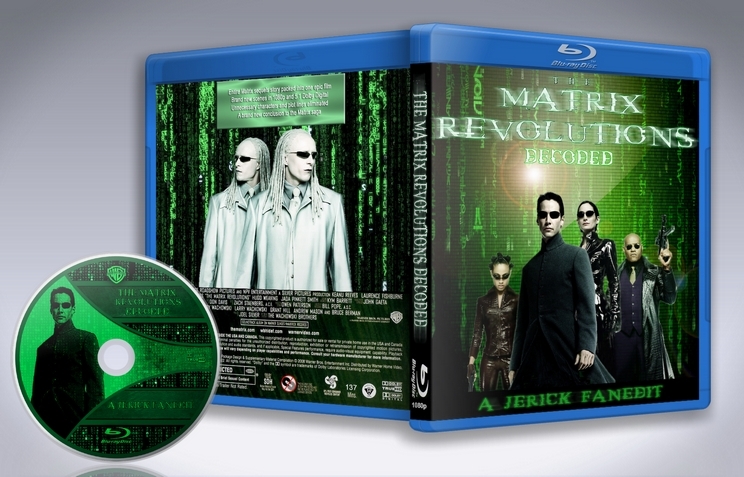 All added scene from "Enter the Matrix" have been upconverted to 1080p, color corrected, sharpened, and had a custom 5.1 surround sound mix added. Much of the footage from Zion has been removed, a quick introduction is given to the important characters. There is no rave scene, no Bane subplot, etc. The tower to the source sequence has been dramatically changed, no Smith, no Trinity entering The Matrix, no bomb, no rooftop save, the meeting with the Architect is heavily reworked as well as the Architects motivations. and Neo's reaction to them. Some new visual fx work makes some of these cuts possible. Countless edits were made to the battle for Zion including but not limited to: all scenes with Zee and most of the infantry have been removed, Captain Mifune saves the day and opens the gate instead of Kid, action has been kept tight and intense, the battle quickly gets out of hand for humanity. This is my favorite sequence of edits and I hope you enjoy it! Cut several scenes building up hopelessness for the finale. Neo and Trinity's flight to the machine city has been completely reworked, this is where Neo gets his eye injury in this edit. Most of the instances in which Neo is seen wearning eye bandages have been removed or replaced of shots from earlier in the movie. The cut on Trinity's neck has been recolored to look like a smudge or a piece of her hair. The ending is completely reworked, a montage of scenes roll behind the credits. Closure for Morpheus, Niobe, The Architect, Trinity, Zion celebrates. Trinity recovers Neo's body as her final act of love for him. I should clarify immediately that I have not revisited Reloaded and Revolutions in their entirety since their respective opening weekends, so take my review as you will. Memory is not perfect, and I took advantage of the situation by making my viewing of the Matrix conclusion a "fresh" one. As far as visceral experience is concerned, I have enjoyed re-watching the Matrix sequels in this format. I will highlight one outstanding improvement, and that is narrative pacing. 'Decoded' brings the Matrix conclusion to a succinctness that was severely lacking from my Reloaded/Revolutions viewing from yesteryear. The overall quality of the picture and sound compared to the original was excellent; quite negligible as far as technical differences are concerned. Considering that HD releases for 'Decoded' and the original films are contemporary, I think expounding upon this further is moot (and, frankly, not my strong suit at the time of writing this review). The overall quality of the visual editing was great; seamless for the most part. There were genuine moments of awe where I had to re-watch clips of the original movies to figure out if a certain sequence of events were actually Jerick's doing. From a technical standpoint, there were very few cuts that personally stood out. Luckily, the cuts that were obvious were not immersion-breaking. Off the top of my head, there were only 2-4 transitions that were acutely jarring but not bad enough to sully my savor of the film, but cute enough to make me smirk and think, "Obvious cut". The visual editing was a success. The overall quality of the audio editing was smooth. As far as my perception brought me, audio pieces blended in well, and nothing was rough, abrupt, and obviously cut to my ears. Like in Visual Editing, similar criticisms apply, such as 2-4 transitions being acutely jarring but not bad enough etc. The audio editing was a success. when Neo and Trinity pilot the Logos into 01, i.e. Machine City, and Neo loses his eyes thanks to a "Ghost Sentinel"(???). I understand that Smith-Bane was intended to be removed from 'Decoded' as much as possible, and I honestly would not know how to re-cut the blind Neo situation, but seeing what I saw was jarring enough to break my suspension of disbelief and result in a fit of laughter. That being said, 'Decoded' did the best it could with the cards dealt. 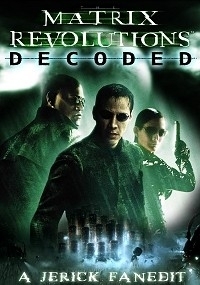 The re-structuring of the overall sequel(s) narrative was a success, despite the aforementioned quirk, and, as emphasized earlier, 'Decoded' brings the Matrix conclusion to a succinctness that was severely lacking from its source material. I'm really not that picky. Even the few jarring cuts spliced here and there coupled with the plot-point mentioned above left me feeling an innocent sense of comic relief rather than immersion-breaking disappointment. I enjoyed the Matrix Trilogy as a whole when it first came out, and, with time, 'Decoded' reinvigorated my love for the Matrix more than the two original sequels ever could. I'm a huge fan of the original Matrix (1999), and 'Decoded' brought a satisfying conclusion to the series. WOW. I'm impressed. I have recently tried to watch several edits that combine Reloaded & Revolutions together. For me, this was the one that really worked. This edit keeps only the important material to keeps the movie flowing, engaging and focused. I like that the choice Neo has to make is not between 'rebooting' Zion or saving Trinity but between 'Rebooting' Zion or fighting for Zion. This made the whole conversation with the Architect so much clearer, more focused. It's all about Zion. I understand that this shifts the focus away from Trinity, making her a secondary character. She is now just Neo's girlfriend who assists him with his mission. So the fact that she, through her love, made Neo the one loses it's significance. But, despite this change - I liked the narrative this edit was going for. In this edit Neo's real life super powers are no more. Smith-Bane is no more. Sure, it results in some cuts look abrupt; Cuts such as Neo and Trinity entering the machine city, bombs exploding before they reach their ship and Neo losing his eyes. Also, there's no emotional response from Trinity to the death of Neo at the end. She just operates some machinery. I think, perhaps Trinity's death should have stayed in the finished edit somehow. Bottom line, This edit has shown me an alternative vision for a good and worthy sequel to 'The Matrix'. When the end credits (which were extremely well done) rolled, I had a smile on my face. I grabbed a copy of the deZIONized fanfix years ago when it first came out... but never bothered to watch it. It seemed like such a good idea but perhaps I had just had enough after the bad sequels. Then, I pretty much forgot about The Matrix altogether for more than a decade, probably for the same reason. A couple weeks ago, however, I rewatched the first film and the sequel pair. I had forgotten how much I like the first film but was not surprised by how much I didn’t like the sequels. Thus, I gave the first film 9 stars on IMDb and the sequels both 3 stars (they are just one long movie to me, as most seem to agree, only split into two movies to milk the audience for cash and, thus, share the same rating regardless). And there lies the baseline: 3 stars. I feel like this edit is reaching for 6 stars but falls a bit short of that – which is still maintaining a significant improvement over the originals. I feel that this edit is 90% on the right track for fanfix ideas but that other 10%, some of it intentional, hurts it pretty bad for me. My movie ratings are driven primarily by the story and the craftsmanship around telling that story. FX and fight choreography, for example, can make a good film a bit better, but they can’t make a bad film better by even a single star (unless the film is primarily about FX or fighting) thus the harsh 3 stars on the sequels. The great part of this edit is that it treats Zion with the right amount of attention. I feel the original tried to make Zion more interesting by showing it to us but they ended up showing us something more like the evil community from a Mad Max film – primarily due to the “temple” scenes. Something to hate. All that stuff to hate is gone in this edit while keeping the more likable or, at least, identifiable parts... and the rest of Zion is probably best kept a mystery. And that takes me to the weakest part of this edit: the character development. A lot of the character development (and, consequently, plot development) seems to have been dropped and it hurts the edit equally. Yes, the sequels probably had too many characters to develop but I wouldn’t cut anything that develops the more critical characters. Smith somehow didn’t feel as evil or as powerful in this edit and I’m not sure why. He felt more like an annoyance than the villain. I also felt like we didn’t spend enough time with pretty much everybody else that was left in. In the end, this felt like it wanted to be an action movie that merely suffered the bits of drama it needed to hold the action together. I see The Matrix as the other way around pretty much. And to tell that “heady” side of the story, you need to take your time to give the audience time to digest what you are delivering – something American films are pretty bad at to begin with, so I probably wouldn’t suggest cutting these parts any harder. A lot of these headier scenes and other dramatic scenes where chopped as short as possible and ended up feeling like someone rushing though the agenda at a terribly boring meeting (while taking a 10-minute recess to work out a fistfight once in a while). These quick back-to-back scenes kill the pacing rather than fixing it. Now, just because my ratings are primarily driven by story, this doesn’t mean I don’t appreciate good action choreography as well. I do. On that line, I personally found it very disappointing that perhaps my favorite scene from the sequels was cut: the fight with Sereph. I found this scene to be both interesting intellectually as well as a great fight scene (and it develops Sereph more). The tension of being pretty sure Sereph was a good guy but not being entirely sure why they are fighting was marvelous with an enjoyable finale and explanation to it. The chop of this scene kinda foreshadows the chop of some other tense action. For example, even though I agree many action scenes carried on too long in the sequels, the invasion of the dock was very long also... and yet also very appropriately built up a high level of how terrifying such an invasion might be. Most of that build up of terror was lost here. I think the dock scenes were also recolored but I haven’t bothered to check that against the source. It just felt like I couldn’t see the machines as well as I could in the original and thus subduing their threat even more. Another difficult part of the sequels’ story is with the relationship between Neo and Trinity. The first film handled this well by simply leaving the tension there and not touching it much. Similar to how the sequels handled Zion, however, they tried to make this more interesting by resolving their love and showing it to us. That’s a classic boneheaded move. Even in a martyr film. This edit, fortunately, cuts most of that resolving... but I think it could be done better by cutting it even more to leave it as unresolved as the first film. In other words, cut the elevator passion as well and leave Neo with the disciples with no promises of what might come next. The leap to Neo going for a night walk was a bit jarring so rework focused more on the disciples and less on Trinity in this section might help. And then there’s the brief and really strange ending. So many head scratchers here. I think the problem here starts with leaving Bane out entirely. He probably can’t be left out if we have a blind Neo in the end. Otherwise, it feels ludicrous to blind Neo for no significant plot reason just before the climax. Also, a blind Neo needs some story support for how he is still able to function by jacking into the machines without physically jacking in. Sure, he doesn’t need to be so powerful as to stop machines in flight, but elimination of all his crossover power is likely too difficult to hold up with the given footage. And, in that, could be the answer as to how to handle Bane: take out some of the blatant Smith control stuff with Bane and leave Neo less sure of what he is seeing there. Leaving Bane in might also help with a weak part of the originals that gets weaker in this edit: How did all the other ships get destroyed exactly? This gets covered so quick in the original I didn’t really understand it until much later in the film. Less so here. Personally, I see no reason to save Trinity or Neo, especially when no other movies are likely to follow (assuming Neo is dead), but I don’t really feel a need to be too critical of fanedits that change the story like this. Such things are the editor’s prerogative even I feel it weakens it by losing the martyrdom story. That’s fine and I’m okay with that. If I want another ending, I can do that myself. The problem here, however, is that I completely didn’t fully “get” the intended ending meaning until I reread the change notes. Whoosh! Part of it right over my head and I wasn’t Drax enough to catch it. Using the club hell footage to create an Ewok style ending celebration was a cute idea... but it is also... a cute idea, for better or for worse. Resolving Morpheus and Niobe there worked pretty well. The Architect??? Again, Drax. I can recommend this edit for those who have seen the sequels, didn’t like them, and want a new take. I can’t, however, recommend it for anybody who hasn’t seen the sequels. Still looking for that edit. Too much was cut in this edit – maybe 30 minutes too much. I feel a 7-star edit is probably the most that can be got out of the sequels, I just need to find it (if someone has done it already) or wait for someone to create it (because I’m not convinced a 7-star edit is worth the time for a personal project and I should probably just pretend the sequels don’t exist). Only some minor "anti climactic" cuts here and there hamper this edit's attempt at perfection. The cut after the APU corps scream after Mifune rallies them comes in mind as being too abrupt and cutting to a very low key scene. Then, the split second where the Oracle is shown before Smith assimilates her didn't look right. Don't know if it was because it was too short, trying to avoid the part where she starts to speak, or the gesture with her hand which made no sense in that context, but it just didn't work for me. Besides attempting to shorten the Burly Brawl as other reviewers have mentioned, I'd have tried to kill parts from the highway scene. The part when the twin gets into the trio's car is truly cringe-worthy and I regretted having to see it again in this edit. Other minor stuff I would have trimmed are the slo-mo punch to Smith's face and the "everything that has a beginning has an end" line, which has no relevance since it had never been uttered before that point. Also, I'd think Trinity could have still been made to die if the editor kept Neo finding her impaled, and added her "your eyes" line, delivered in a shot where only Neo was visible, letting her die soon after. Apart from Neo's evident absence from the trip to Machine City, seeing Neo leave to meet baby face with no explanation why she stays behind, or what she does during the final confrontation, or even how she finds out the whole thing is over, just doesn't work. Finally, the artificially slo-mo'ed flashback to the mechanical arm picking Neo up from the sewer looked especially "hacked in". On the positive side, among other nice cuts, I was surprised at how well the editor managed to change the narrative to have Mifune be the one to open the dock's gate and die afterwards. All things said, the minor gripes I mentino don't take back from the fact that this is a masterfully superior experience than having to sit through Reloaded and Revolutions, and I certainly recommend it.